Traffic Authority found at trafficauthority.net has some secrets hidden behind their flashy sales material and professional-looking website. There are a lot of hypes surrounding the program, especially their claim of making $500,000 for their members within a week’s time. But the important question remains – is Traffic Authority a scam? Read the full Traffic Authority review to find out the true nature of the company. Verdict – Is Traffic Authority a Scam? Traffic Authority was launched on 26 August 2015, replacing the now-defunct Infinite Leverage Platform. 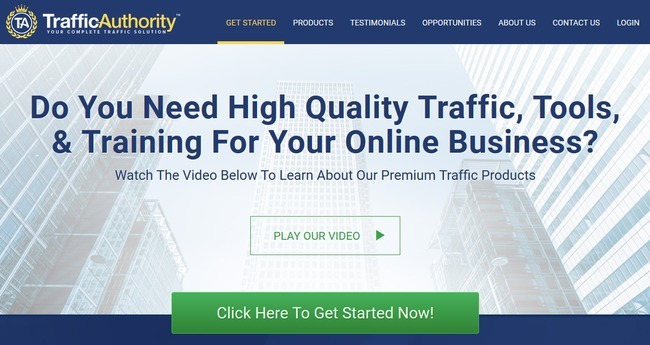 Traffic Authority claims to be the one-stop solution for your online business – by providing you a training platform, generating traffic to your site, and even an affiliate program that lets you sell their products to generate commissions. In fact, a big part of Traffic Authority focuses on the affiliate program, where every member is required to buy the Traffic Packages before they can start earning commissions from Traffic Authority platform. However, Traffic Authority’s products and services are grossly overpriced. In this review, we’ll break down their pricing structure in details, and walk you through what Traffic Authority has to offer. Even though you can become a member for free, you don’t actually get access to any of the training videos, or even any services of Traffic Authority. In fact, the members area of Traffic Authority is just a marketplace for their overpriced products. If you want to learn how to set up a website for online business, you will need to purchase Traffic Academy ($97/month) to get started, which is grossly overpriced. You can get better trainings at Wealthy Affiliate for free. If you are a website owner looking to get some web traffic, you will need to shell out big money to purchase traffic from Traffic Store ($220 to $8237). 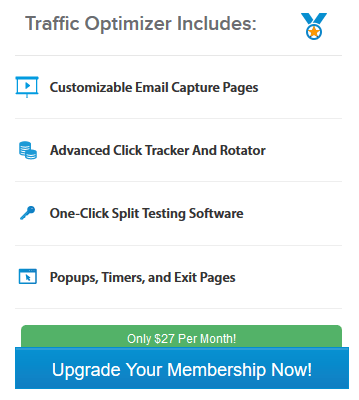 If you are an internet marketer looking to build some personalized landing pages to capture emails and split test, you will need to purchase Traffic Optimizer ($27/month). Finally, if you are an affiliate and want promote Traffic Authority for commissions, you are out of luck too. 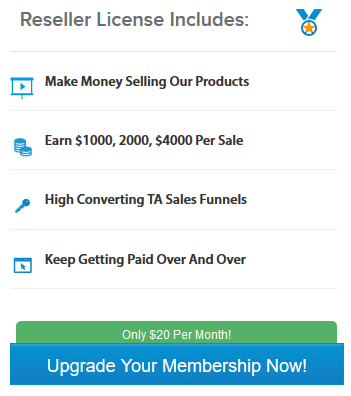 You need to buy the Reseller License for $20/month just to promote their products, after purchasing their expensive traffic package. More on that below. Almost all newbies to internet marketing will need to purchase Traffic Academy to get started. 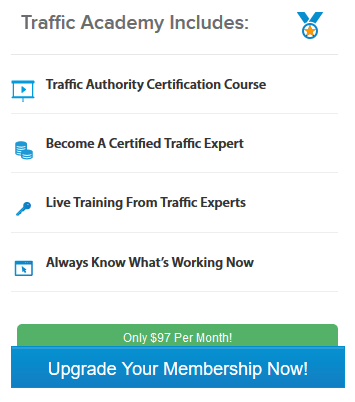 The Traffic Authority Certification Course included in Traffic Academy incorporates training materials that encourage you to purchase traffic from Traffic Store, which is their big ticket items. At $97/month, the Traffic Academy course is just severely overpriced for any inexperience internet marketers who want to get started. Again, Wealthy Affiliate provides a much better certification course when it comes to building an online business. And you can get started with their course without paying a cent. Once you have built the initial structure of your website, you will be encouraged to purchase Traffic Optimizer to create popup pages, and to capture visitors’ email. After purchasing Traffic Academy at $97/month, you would think that the package includes whatever tools you need along the training. But NO. 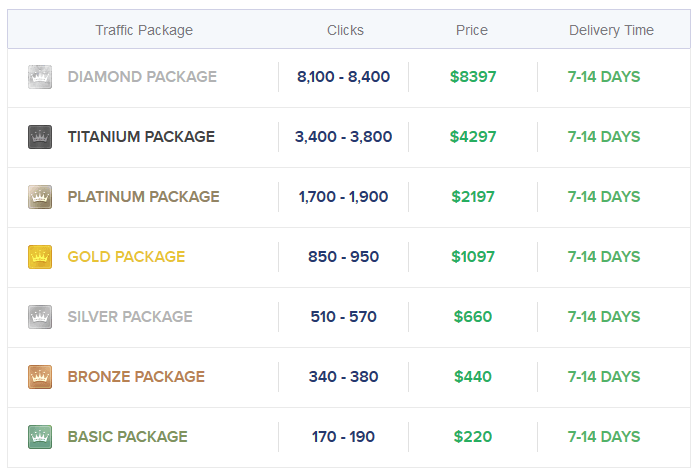 You have to purchase the additional package in the form of Traffic Optimizer, which costs you an additional $27/month. Granted, the tools are legitimate and not overpriced, but you can only use them to promote Traffic Authority. The functionalities are pretty limited if you want to use it for other businesses. That’s not all. The real focus and the high ticket items of Traffic Authority are in the Traffic Store. So what happens when you have a working website and landing pages to capture the visitors’ email addresses? All these setup are useless if you don’t have people, or what we call web traffic visiting your website. This is when Traffic Authority introduces their Traffic Store, where they sell web traffic and clicks to your website. 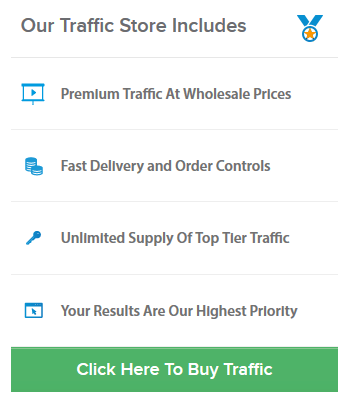 Traffic Authority claims that their traffic quality is top-tier, and you will get visitors who are highly likely to buy things from your website. However, all we know is that Traffic Authority gets their web traffic from third party providers, as the sources of these traffic are not disclosed. We have no way to ascertain if these are indeed interested visitors or just cold traffic. If you want to buy clicks to your website, there are several packages to choose from, but none of these packages are cheap by any means. Every tier of their traffic packages turns out to be more than $1/click, which is extremely overpriced. If you choose to advertise your website on Google, in most cases you don’t even have to pay $1/click. Not only that, by advertising on Google, at least you can be sure that these clicks are genuine people interested in your products because they searched for the product, saw your advertisement and clicked to your website. With Traffic Authority, you have no way of knowing if these are genuine visitors, or if they are interested in what you have to offer at all. In the sales video of Traffic Authority, they emphasize that you can promote their products and get big paychecks. So how does it work? This is where Traffic Authority employs a Multi-Level-Marketing (MLM) tactic to sell more of their products. Firstly, if you want to promote Traffic Authority’s traffic packages, you will need to purchase the reseller license at $20/month, which is ridiculous. Can you believe you have to pay Traffic Authority $20/month to help promote their products? This is the one of the biggest disadvantages of MLM business model, where you often have to pay to promote their products. If you think paying a $20/month reseller license fee entitle you to a commission on all products, you’re dead wrong. The catch is, if you want to earn commission for a certain traffic package, you have to first buy it yourself. You only make 50% commissions if your referrals purchase the same traffic package that you have already bought before. Let’s consider this scenario. Let’s say that I am an affiliate of Traffic Authority, and I bought the basic package at $220. If I promote Traffic Authority to you and you end up buying the diamond package at $8397, I won’t earn a single cent, because I have never purchased the same package before! So what’s the best bet? If you want to capture all the commissions from your down-lines, you have no choice but to buy ALL the traffic packages Traffic Authority has to offer. If you don’t, you will have to give up the commissions for your first 3 referrals. The first 3 commissions will automatically pass up to your sponsor (the person who referred you into the program), and you will only get the referral fees from your 4th sale onward. Even if you are an affiliate who purchase the same tier of product, you still have to give up 50% of your commissions to your sponsor for the first 6 sales. From the 7th sale onward, your commissions will be split 80/20 with your sponsor. Let’s do a bit of math to see how everything adds up, assuming we invest in the lowest tier of products to save costs. At the bare minimum, we are looking at $364 of start-up costs, with a hefty $144/month recurring fees. For the first 6 sales of basic package, you are entitled to 50% of the commissions you make since you purchased a package of the same level (basic package). 50% of $100 commissions (basic package) = $50/sale. The other 50% goes to your sponsor, who may or may not have helped you in making the sales. Subsequent sales of the basic package will net you 80% of the $100 commissions = $80/sale. Again, 20% of the commissions go to your sponsor, who may or may not have helped you in making the sales. Is it fair that you have to give up part of your hard-earned commissions to an internet stranger whom you most likely don’t know? I’ll leave it to you to decide. Personally I don’t think that’s the best use of your time and investment, which is why I strongly gravitate towards affiliate marketing, where you can join for free and make full commissions from your effort. Anyway, for Traffic Authority, as you may have probably realized, it is not exactly profitable to just focus on selling the training and traffic packages. To make real money, you will have to focus on recruiting more members and make profit from their sales and commissions. If you have absolute confidence in recruiting members and keep them motivated in making sales, there may still be money to be made. It’s pretty similar to other high-ticket item companies such as MOBE and Digital Altitude, but I wouldn’t recommend that you go this route. There are much better ways to make honest money online. Is Traffic Authority a Scam? It’s debatable whether Traffic Authority is a scam, but one thing is for certain – the products and services are grossly overpriced. Most victims fall prey to scams and overpriced products simply because they don’t know there are better alternatives out there. It doesn’t make sense that we have to pay Traffic Authority in order to promote their products for them. Also coming from a paid advertising marketer, their CPC of $1/click is way way overpriced. Want to know a real scammer check out 4% group got me to buy into a motor club and I don’t even have a license to drive. Best thing is you can’t find were to cancel. What sales pitch did they use to make you sign up in the first place?